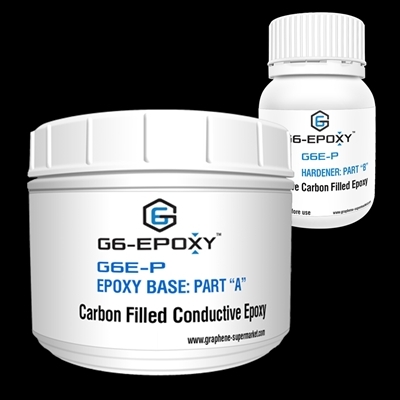 We are currently offering this product on our sister website, Graphene Laboratories, Inc.
Click here to purchase this product: G6 - Epoxy-P @ Graphene Laboratories, Inc.
G6-Epoxy™ G6E-P is a two component electrically conductive epoxy for high performance bonding, sealing and coating. We use a proprietary mix of high-performance carbon filler to achieve superb electrical properties for a non-metallic electrically conductive epoxy. It can cure at room temperature or more rapidly at elevated temperatures. The optimum cure schedule is overnight at 25°C followed by 4 hours at 80°C. THE MIX RATIO: 100 (Part A) to 50 (Part B) by weight. MIXING INSTRUCTIONS: Add Part B to Part A and mix slowly until uniform in separate container. Vacuum degassing is recommended. SAFETY & HANDLING: Please always read the SDS before use. Use the product with adequate ventilation. Keep away from sparks and open flames. Avoid prolonged contact with skin and breathing of vapors. Wash with soap and water to remove from skin. G6E-P can be also packaged in various sizes and units to accommodate customer's needs.